Without question, the most important part of my job as a member of Congress is to serve you, my constituents. It is my passion to serve that drives me to wake up each morning and fight for you in Washington. Every day votes are held, I commute from my hometown of Montross, and I drive past the homes of friends I’ve known all my life; that keeps me grounded as I start each day. From cutting through the bureaucracy to arranging Capitol Tours, I want to do everything I can to provide the best service possible to my constituents. As your member of Congress, I serve as a liaison between you and federal agencies. My staff and I frequently help people navigate issues they're having with federal agencies. Although I cannot override the decisions made by a federal agency, I can often advocate on a person's behalf to get answers to questions, find solutions, or just cut through the red tape. Just this Congress, my amazing district staff completed over 1,500 cases. Last week, I had the great pleasure of meeting with some folks to hear their casework success stories. Cheryl reached out to my office for assistance in securing the necessary paperwork for her VA home loan. We assisted her in navigating the Navy bureaucracy and Cheryl was able to purchase her home. 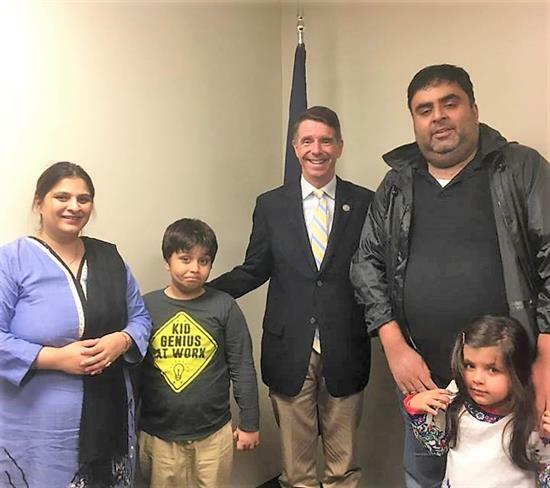 Saeed requested assistance in securing visas for his young children, who faced the prospect of being left behind in Pakistan and separated from their parents while their visas were being processed. My office was able to cut thru the red-tape at USCIS and the State Department and obtain visas for Hassan and Hania. If you ever have a problem with a federal agency or need assistance, please check out my website or call one of my local offices in Stafford, Tappahannock, or Hanover. In order to provide assistance to residents who do not live near my district offices, I want to invite you to visit one of my satellite offices. Click here to view the locations and schedule. I always put the First District First. My top priority will always be serving you and it is an honor to serve you and Virginia's First District in the People's House.